Are you skipping a step? You brush twice a day, you floss occasionally, and you’ve been to the dentist at least once in the past two years. So that means you’re taking care of your teeth, right? As it turns out, most of us aren’t observing proper tooth hygiene. For starters, most of us aren’t brushing properly. “Many people just don’t brush long enough. Most of us brush less than a minute,” says Cynthia Sherwood, DDS, FAGD, a spokesperson for the Academy of General Dentistry (AGD). 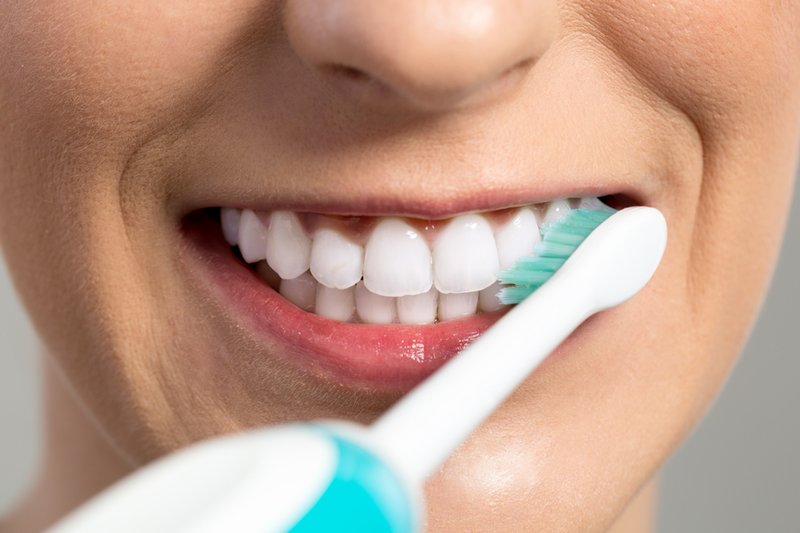 It’s time to “brush up” on your dental hygiene and learn about some surprising habits that can both hurt and help your teeth. When you brush, and for how long you brush, matters. “To effectively reach all areas and scrub off cavity-causing bacteria, it is recommended to brush [after breakfast and before bed] for at least two minutes,” Dr. Sherwood says. If your gums are bleeding, the most likely culprit is plaque caused by inadequate brushing and flossing. “If plaque sits on teeth and under the edges of the gums for more than 24 hours, it forms toxins that cause inflammation and bleeding. So the soreness and inflammation just gets worse and worse,” Dr. Sherwood says. “I see a lot of patients who tell me that if their gums bleed, they try not to brush them because they are afraid that it will make it worse and it will hurt,” she says. Instead, make sure you’re brushing thoroughly and for at least two minutes and if it doesn’t get better after a week, head in to your dentist for professional help. There is, however, such a thing as brushing too thoroughly. When you brush, make sure not to saw back and forth and press hard, but opt for gentle circular motions across each tooth. After brushing, make sure to swish with water and remove any excess toothpaste. Opt for soft bristles (harder bristles can damage gums) and replace your brush whenever it begins to show wear, or after 90 days, whichever comes first. It may seem like a hassle, but it’s a necessity for a healthy mouth. “Flossing is just as important as brushing. Not flossing puts you at an increased risk for developing gum disease,” Dr. Sherwood says. Floss goes where your brush can’t—between your teeth—to remove plaque and debris, and it can also help reduce bad breath. Floss before you brush, both in the morning and before bed to remove all the food and plaque you built up in the day. Make sure to floss up, down, and around teeth to ensure you’re getting all the nooks and crannies. Your doctor may recommend using mouthwash if you have issues with halitosis or need fluoride. The AGD recommends avoiding mouthwashes that contain high levels of alcohol (18-26%), which can dry out the mouth and produce a burning sensation. To get the full benefits, swish for 30 seconds, then avoid eating, drinking, or smoking for 30 minutes after spitting out. While flossing and brushing are musts for everyone, what you eat can hurt or help your teeth. The big one—it’s time to ditch sweetened beverages. “Sports and energy drinks and soda can cause harm to teeth. The high acidity levels in these drinks erode tooth enamel, the glossy outer layer of the tooth,” Dr. Sherwood says. High levels of acidity in diet sodas can actually cause as much damage to teeth as methamphetamines. “Damage caused to tooth enamel is irreversible, and without the protection of enamel, teeth become overly sensitive, prone to cavities, and more likely to decay,” she says. For all the cheese lovers out there, slice up another piece of brie! A recent study by the AGD found that eating cheese with a glass of wine or after a meal can help balance acidity levels in the mouth, which protects tooth enamel. Low-fat cheese worked just as well as full-fat, which is good news for your healthy diet. It might be time to add a cheese course to your dental routine?